ABC has announced their schedule for Fall 2018. There are quite a few new shows on the way and the network is moving a bunch of their programs around. Of the three networks that have released their schedules so far, the alphabet network is making the most changes this fall — including two concurrent editions of the Dancing with the Stars franchise. There’s no shortage of comedy shows on ABC’s schedule. They’ve got 10 of them slotted right now. It’s interesting that ABC is trying to once again establish a comedy block on Friday nights — just as FOX is doing the same thing with the revival of Last Man Standing (which used to air on ABC’s Friday night schedule). Returning ABC shows for Fall 2018: 20/20, The Alec Baldwin Show (fka Sundays with Alec Baldwin), America’s Funniest Home Videos, American Housewife, Black-ish, Child Support, Dancing with the Stars, Fresh Off the Boat, The Goldbergs, The Good Doctor, Grey’s Anatomy, How to Get Away with Murder, Modern Family, Roseanne, Shark Tank, Speechless, Splitting Up Together, and Station 19. New ABC shows for Fall 2018: Dancing with the Stars: Juniors, The Kids Are Alright, A Million Little Things, The Rookie, and Single Parents. 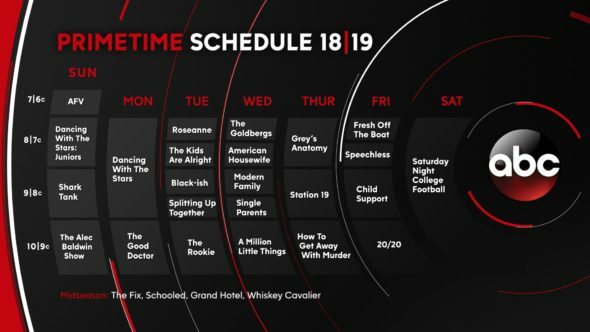 Check out how the ABC schedule lines up with the other networks’. 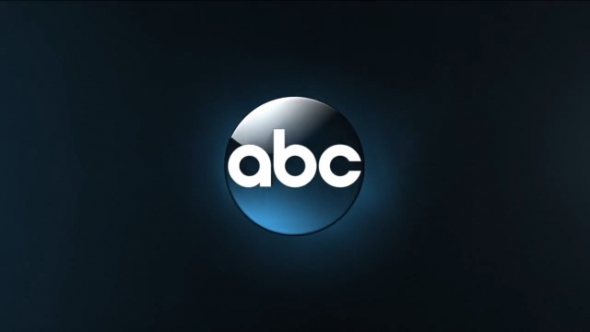 Keep up with all of the cancelled and renewed ABC TV shows on our status page. What do you think? Do you like the sound of any of the new shows? What do you think of the new schedule? Will their new comedy blocks work? More about: 20/20, 20/20: canceled or renewed?, A Million Little Things, A Million Little Things: canceled or renewed?, ABC TV shows: canceled or renewed?, America's Funniest Home Videos, America's Funniest Home Videos: canceled or renewed?, American Housewife, American Housewife: canceled or renewed?, Black-ish, Black-ish: canceled or renewed?, Child Support, Child Support: canceled or renewed?, Dancing with the Stars, Dancing with the Stars: canceled or renewed?, Dancing with the Stars: Juniors, Dancing with the Stars: Juniors: canceled or renewed?, Fresh Off The Boat, Fresh Off The Boat: canceled or renewed?, Grey's Anatomy, Grey's Anatomy: canceled or renewed?, How to Get Away with Murder, How to Get Away with Murder: canceled or renewed?, Modern Family, Modern Family: canceled or renewed?, Roseanne, Roseanne: canceled or renewed?, Shark Tank, Shark Tank: canceled or renewed?, Single Parents, Single Parents: canceled or renewed?, Speechless, Speechless: canceled or renewed?, Splitting Up Together, Splitting Up Together: canceled or renewed?, Station 19, Station 19: canceled or renewed?, The Alec Baldwin Show, The Alec Baldwin Show: canceled or renewed?, The Goldbergs, The Goldbergs: canceled or renewed?, The Good Doctor, The Good Doctor: canceled or renewed?, The Kids Are Alright, The Kids Are Alright: canceled or renewed?, The Rookie, The Rookie: canceled or renewed? You need to bring back more daytime stories. Enough with these talk shows. All my children or one life to live should be brought back. Or new ones. As well as the ones that are on now. ABC has honestly angered me. I will be avoiding ALL OF THEIR “NEW” SERIES. Sorry Nathan I refuse to commit my time to a show where I am vested in the charterers to have them CANCEL the show without giving them a chance to mature. Or have people aware of the show. I love a bit of SCI FI that dosen’t take off in space. We have MANY MYSTERIES ON EARTH AND I LOVE A TIME TRAVEL PROBABILITY. ONE OF THE BIGGEST MYSTERIES ON EARTH-TIME! So ABC can stick it in their ears! I will NOT BE WATCHING ANY SERIES! The Chew, really? While I didn’t care for the cast, it was the best noon show. Canceling The CHEW… bad move!!!! you really think we need another GMA show in the afternoon with 2 host who are already on the am show.? Worst part you canceled The Chew which is one of the best shows on your daytime schedule. So you cancelled the Chew so we can see more of GMA in afternoon. Bad move!!! The Chew replaced All My Children and most of us soap fans are thrilled that nothing has been successful beyond the soaps during those 2 hours. 1-3pm, EST shall always be cursed, rightfully so, forever. The Chew actually lasted much longer than expected. Very pleased to see The Good Doctor and Roseanne renewed this next season. And…since I’m a Nathan Fillion fan, I will certainly check out The Rookie on Tuesday nights. Thanks for the update!